The Ruisdael seascape just looked lonely, y’know? Now it’s part of a surf ‘n’ turf pair. Jacob van Ruisdael, Edge of a Forest with a Grainfield, oil, c. 1656. The Kimbell Art Museum has bought a great Dutch landscape to go with its great Dutch seascape. The seascape just looked so lonely, you know? Now it’s part of a surf ‘n’ turf pair. 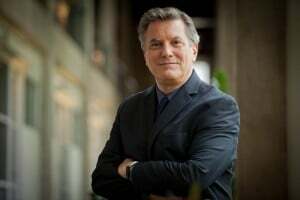 The Fort Worth museum announced that it has acquired Edge of a Forest with a Grainfield, painted around 1656 by the leading master of Dutch landscapes, Jacob van Ruisdael (he always signed, never dated, his paintings, which is why their dates of origin are usually vague). In 1811, the oil painting was donated by an alumnus to Oxford University’s Worchester College — where it remained for 203 years. It was purchased privately by the Kimbell through Christie’s in London. Experts have valued the painting at $8.5 million, but the Kimbell would not release a specific purchase price. Ruisdael worked in Amsterdam during the golden age of Dutch painting — his contemporaries included Vermeer and Franz Hals — and he had a ‘circle’ of fellow painters he influenced. But he conveyed his love of the drama and transience of nature in a way that, at times, anticipates Romanticism. In his massive survey, The Golden Age, Robert Haak cites Ruisdael’s “romantic monumentality,” referring to the size of his paintings and the often-towering cloudscapes they featured. 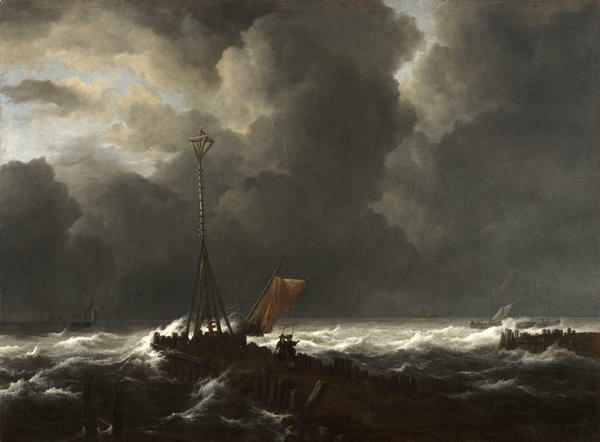 At the Kimbell, Edge of a Forest will join Rough Sea at Jetty, one of Ruisdael’s rare seascapes, in this case a storm scene painted by him in the 1650s, acquired by the Kimbell in 1989 (below). Both paintings are roughly the same size, around 40 inches tall by 58 inches wide, so they are nearly a matched pair. Edge of a Forest will go on display in April, following some small, delicate restoration by the Kimbell’s director of conservation Claire Barry and the mounting of the painting in an antique Dutch frame from 1730. FORT WORTH—The Kimbell Art Museum announced today the acquisition of Edge of a Forest with a Grainfield, c. 1656, an exceptional work by one of the greatest landscape painters of all time, Jacob van Ruisdael. As the leading exponent of the Dutch landscape tradition in the 17th century, Ruisdael was renowned for his love of nature and for his ability to render its glories in paint. The remarkable work, impressively large and in near-perfect condition, is considered by experts to be among the greatest Dutch landscapes in the world. Edge of a Forest with a Grainfield was donated by an alumnus to Oxford University’s Worcester College in 1811. Except for its appearance in exhibitions, including the famous Manchester Art Treasures Exhibition of 1857, the painting remained in the possession of Worcester College until its purchase by the Kimbell Art Foundation through a private treaty sale negotiated by Christie’s, London, represented by Nicholas Hall. The painting is in remarkably good condition. Before it is put on display at the Kimbell this April, director of conservation Claire Barry will delicately adjust small areas of old restoration. The landscape will be enhanced by an antique Dutch frame, dated to approximately 1730, in the French style, typical of the luxurious but restrained frames placed on paintings by Ruisdael in the century after his death. Jacob van Ruisdael is considered the greatest Dutch landscape painter of the 17th century, Holland’s “Golden Age.” Born in Haarlem in 1628 or 1629, the son of a painter and picture dealer, Ruisdael was probably tutored by his uncle Salomon van Ruysdael, another landscape painter. Ruisdael began painting in his teenage years and moved to Amsterdam in 1655, shortly before he began Edge of a Forest with a Grainfield. Paintings from this period in his life are the ones for which he is most renowned. They typically show a greater emphasis on the majestic power of natural forms—noble trees and cloud-filled skies—and an increased mastery of light effects to give those forms emotional resonance. A prolific artist, he completed some 700 paintings over the three decades of his career, before his death in 1682. Edge of a Forest is ranked as one of his highest achievements, from the years of his greatest genius. A large and imposing canvas, Edge of a Forest with a Grainfield shows a typical scene of Dutch country landscape as imagined by one of its greatest admirers. A grove of old oak and elm trees stands beside a pool or a stream, at the intersection of a sandy road or path. Tall timbers reach towards a cloudy sky, while one tree trunk lies fallen at the left. The trees—standing or fallen—are reflected in the water of the pool, the surface of which is broken by pads of water lilies and bunches of reeds. To the right, in the background beyond the stand of trees, fields of wheat can be seen. In the near ground, the ears of wheat can almost be counted one by one against the darker foliage of scrubby oaks, but in the distance, fields stretch towards a low horizon. 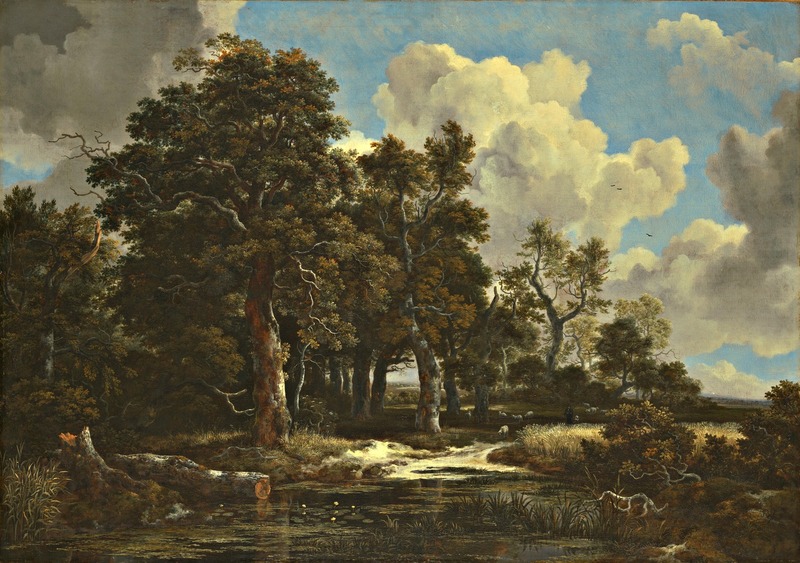 Above the trees, and echoing their shapes, large cumulus clouds rise against a bright blue sky; light reflects on the clouds, as it reflects off distant patches of leaves seen in the spaces between branches. Below the trees, a flock of sheep graze in the shade, watched by a shepherd with a staff, in conversation with a seated woman. Untouched nature, in the form of the oak trees, is placed side by side with the natural world as shaped or husbanded by mankind—the people who sow wheat in the fields or graze their sheep on Holland’s sandy soil. Every detail of the painting attests to the artist’s keen eye and his love of natural variety and incident. Everywhere he leads the viewer towards something he thinks should be noticed: a broken branch lies bent in the lower right, pointing the way into the canvas; a puddle of water in the sandy road reflects the bark of the tree above it; delicate flowers of a water lily poke their heads above the water; a bush is in flower in the shadowy glade beside one of the trees, while silvery-green leaves shine between patches of ivy green. These myriad details, however, do not detract from the impressive unity of the whole—the sense of nature, in its grandeur, captured by a painter who truly loves it. The Reverend Treadway Russell Nash (1724–1811), by whom bequeathed to Worcester College, Oxford, in 1811. The painting remained in the possession of Worcester College since 1811 and was consigned for sale through Christie’s, London, represented by Nicholas Hall.